Saida condo is located in the beautiful spacious Saida Condo complex and is the Beach front unit. 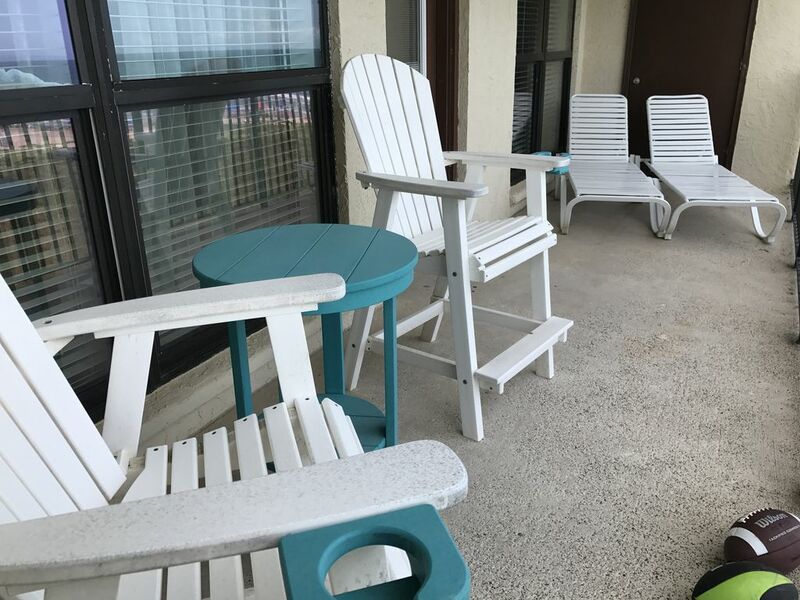 This beachfront unit is located on the 5th floor, where you can view a peaceful sunrise, watch the surf, or just relax on your private 5th floor balcony facing the beach. It is two bedroom two bath each with a plush king bed and TV in both master bath has a jacuzzi tub with shower and second has only a shower. The living, dining, and kitchen are open with views of beach to spend nice family time all in one big space and had a Queen sleeper sofa in the living area. Great views from the balcony of thebeach, we have 2 loungers and a table with two chairs to sit back and relax. We completely remodeled our condo in 2006 and continue to upgrade the unit as needed. We have all tile or wood flooring (no grungy carpet), granite counter tops, new cabinets. We go down regularly to make sure everything is in great condition for guests. We have winter Texans that live in the unit 2-3 months out of the year and treat it as their own home, we try and stay away from spring breakers. Our unit is great for two couples or three if one doesn’t mind a sleeper sofa. Great for families with openness of the unit and everyone busy schedules nowadays, it is nice to be able to gather in one space while cooking, playing a game at the dining table or catching up on your favorite TV series with Wifi and cable TV. You won’t be disappointed with this unit or the Saida complex it is a great gated community with security 24 hours. We would love for you to be our guest and am happy to answer any questions or concerns you might have. If you have a flexible schedule always check out our fall deals when the crowds are less and the weather is cooler. At Saida we always have a heated pool and 3 hot tubs if you want to vacation in the off season. Saida 1 condo complex is the 'best' location on Padre Island!!! We have Bed & Breakfast lodging in Fredericksburg so we have taken the time and efforts to bring those values to our South Padre Condo. We have vacationed in South Padre at the Saida Complex for many years and purchased this condo in Early 2006. We remodeled and refurnished our condo. We have king size beds in both bedrooms with plush pillow top mattress and TV in both. You will feel as if you are staying in someone's home rather than a rental! If you should have any questions please contact us directly at (830) 889-9277. The condo was everything it was pictured to be and then some. Clean and neat; very well equipped kitchen. Outstanding view from the balcony. Several family members had rented units in the same building and could not believe how much better ours was! The condo was clean, nicely furnished, well supplied with everything we needed. And the view from the balcony was fabulous. I don't think you can get a better view. We had three beautiful pools and two tennis courts at our disposal. This condo is as close to the beach as you can get. Steps to the water. Jennifer was very helpful and pleasant to work with. This will be our choice for future beach vacations. The condo was exactly as it was pictured and it was close enough to the beach that we could hear the ocean waves and sea gulls from the balcony. Memorable stay and we hope to stay there again. Well furnished. Very convenient to restaurants. Exceeded our expectations. I was impressed by the 5 star reviews so we booked. No one in my party of 5 had any major problems with the unit.